Much weight has been placed upon the 25% minimum affordable housing in Lend Lease & Southwark’s regeneration agreement. We couldn’t find it in the Masterplan application (12/AP/1092) and the case officer confirmed its absence from the housing and planning statements. 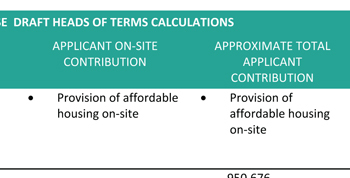 However, there is a reference to the 25% in the application, found courtesy of Soundings and Lend Lease: if you look very carefully you can find it in the draft S106 Heads of Terms document. Under the 3rd column heading shown on the left there is an absence - instead of a figure we have a dash. We not quite sure what this means, but we note that in all other categories of S106 expenditure precise figures are given. Under the 5th column shown on the right we can see Lend Lease does intend to provide affordable housing on site, but in the 6th column, which should tell us the total amount of this contribution there is nothing. Again, in all other categories of S106 expenditure precise figures are given. The only other reference to the level of affordable housing to be provided can be found in the planning application’s Supplemtary Planning Statement below. We can see from this that a financial viability assessment has already been conducted, so both Lend Lease and Southwark also have an idea of just how much affordable housing this development can sustain. We think they should share this information with us.